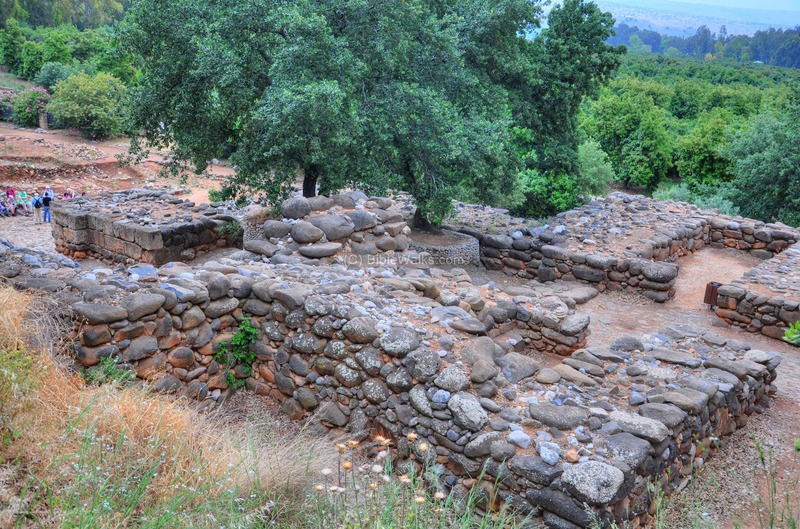 This web page focuses on the Israelite (Iron age) city in Tell Dan. Joshua 19 47: "...the children of Dan... took it, and smote it with the edge of the sword, and possessed it, and dwelt therein, and called ... Dan". 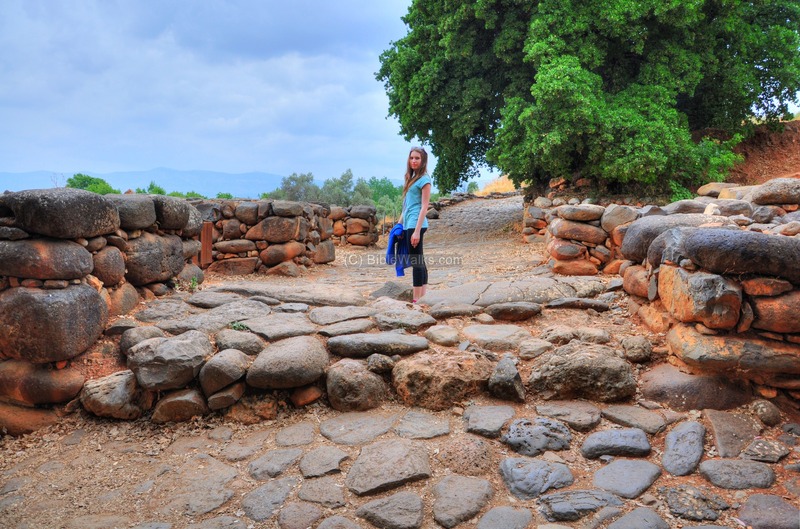 Tell (Tel) Dan is an impressive archaeological site with unique remains of the Canaanite and Israelite cities. This page focuses on the remains of the Israelite city, from the conquest of the Canaanite city (12th century BC) through the Assyrian destruction (8th century BC). For a general description of Dan - see the overview page. 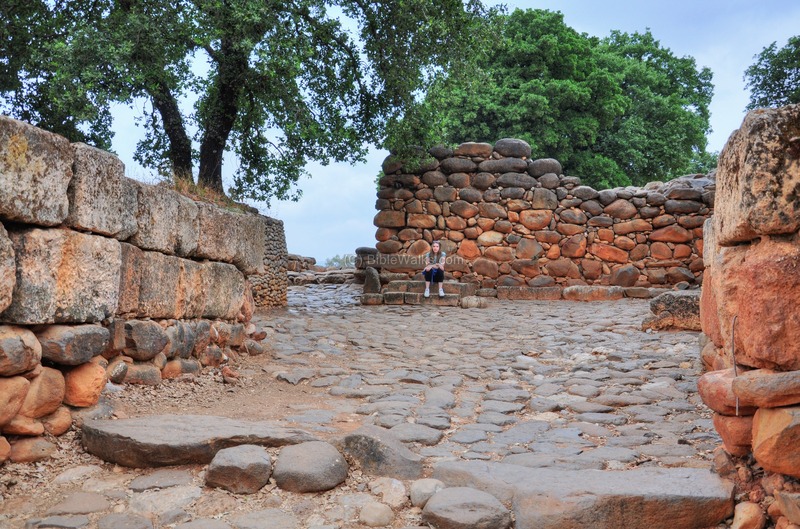 The following focuses on the Israelite Kingdom period, starting from the 10th century BC. For a full history - check the overview page. 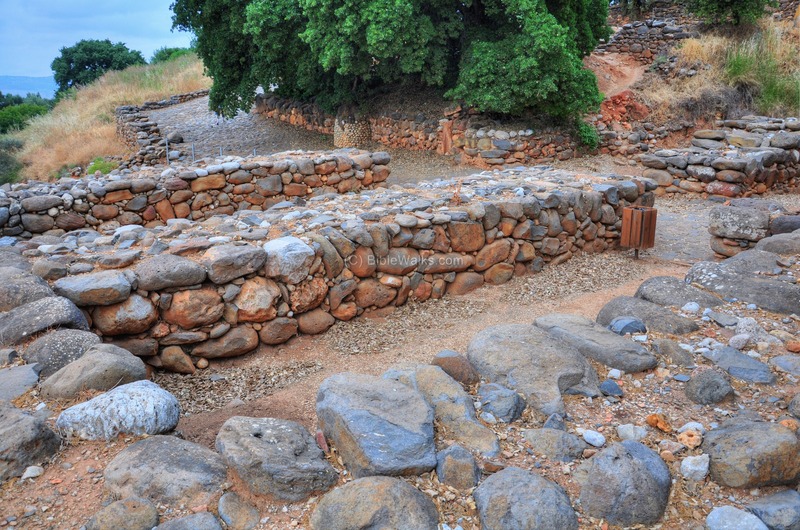 The Israelites conquered and possessed the Canaanite city in the 12th century BC. The Bible writes about this (Joshua 19 47): "...the children of Dan went up to fight against Leshem, and took it, and smote it with the edge of the sword, and possessed it, and dwelt therein, and called Leshem, Dan, after the name of Dan their father". 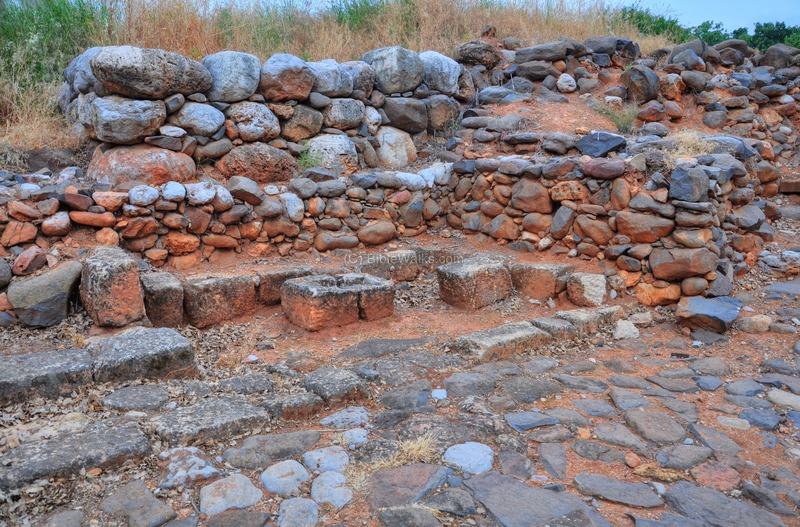 Evidence of a sparse Israelite presence was unearthed in the "settlement" pits on top of the city. 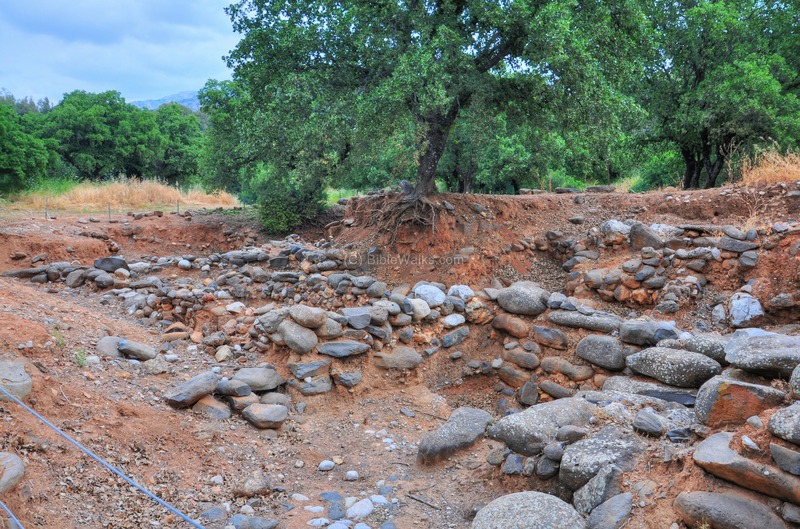 The next phase of settlement was a construction of new structures in the city. The expansion of the city happened during the beginning of the 10th century BC when the Northern Israelite Kingdom separated from the Kingdom of Judah. Jeroboam, son of Nebat, divided the Kingdom after King Solomon's death, and established in Dan a substitute worship place for Jerusalem. The Bible described these acts (1 Kings 12 28-30): ..."Whereupon the king took counsel, and made two calves of gold... And he set the one in Bethel, and the other put he in Dan. And this thing became a sin: for the people went to worship before the one, even unto Dan. ". 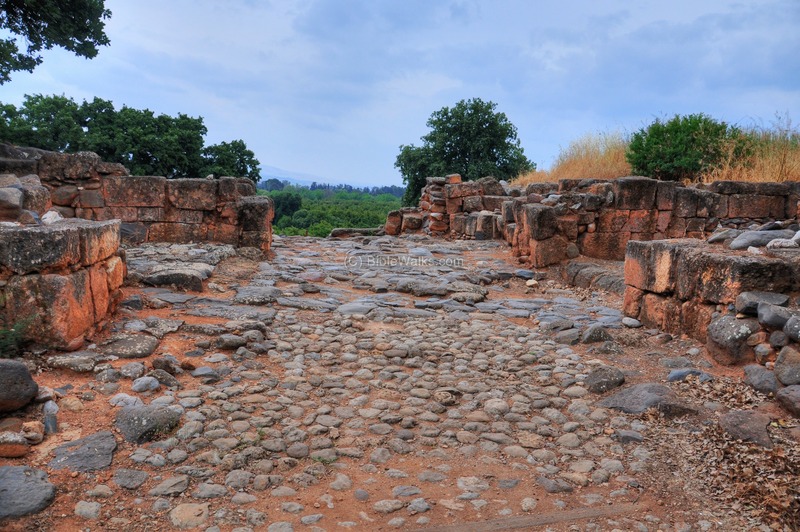 Dan, the northern city, became a pivot city for the new Israelite Kingdom. 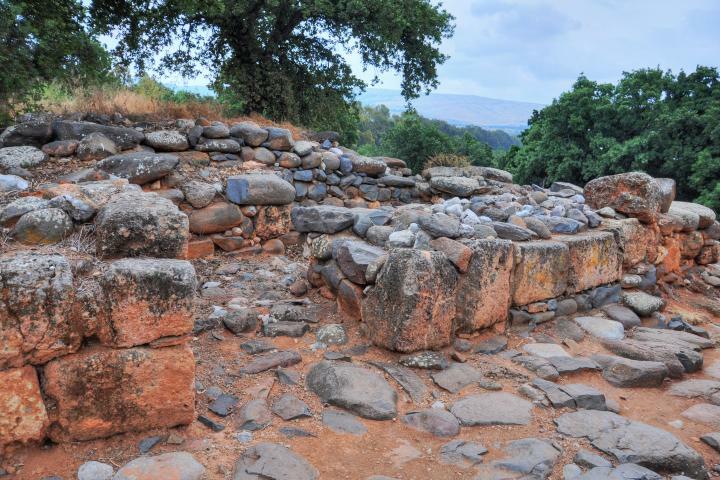 The Northern Israelite Kingdom faced a problem from the north. The rising power of the Kingdom of Aram-Damascus sparked a conflict during the 9th and beginning of the 8th century BC, which affected the city of Dan. During the 9th century BC the Israelite city was burnt, as testified by a layer of ash found during the excavations . This might have been the result of the intrusion of of Syria's Ben-Hadad (885BC) along the North Jordan valley (1 Kings 15 20): "So Benhadad hearkened unto king Asa, and sent the captains of the hosts which he had against the cities of Israel, and smote Ijon, and Dan, and Abelbethmaachah, and all Cinneroth, with all the land of Naphtali". 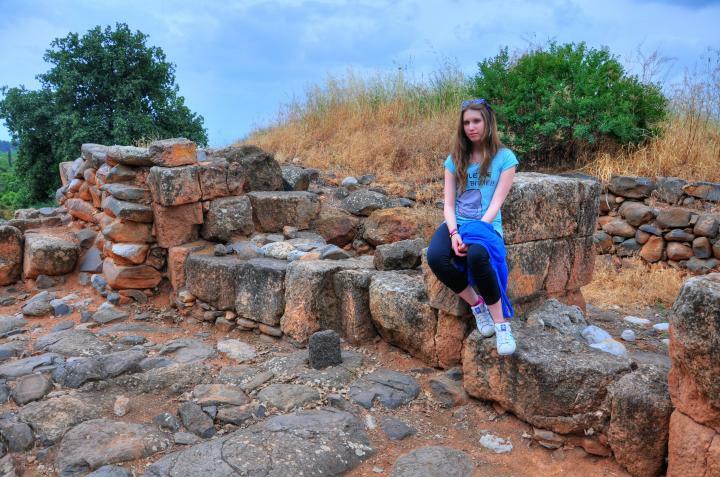 This destruction was also recorded in the excavations of Hazor as well as other sites in the area. 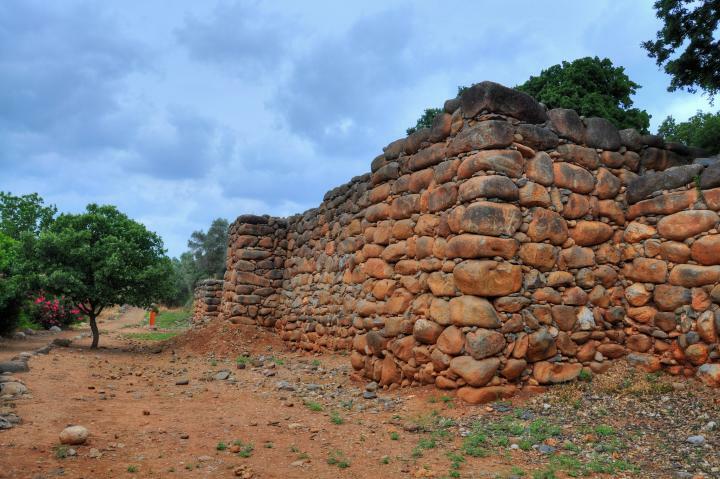 Following the destruction, a massive reconstruction of the city's defenses was conducted: the Israelites incorporated the huge Canaanite ramparts into a new set of walls, and added new gates. 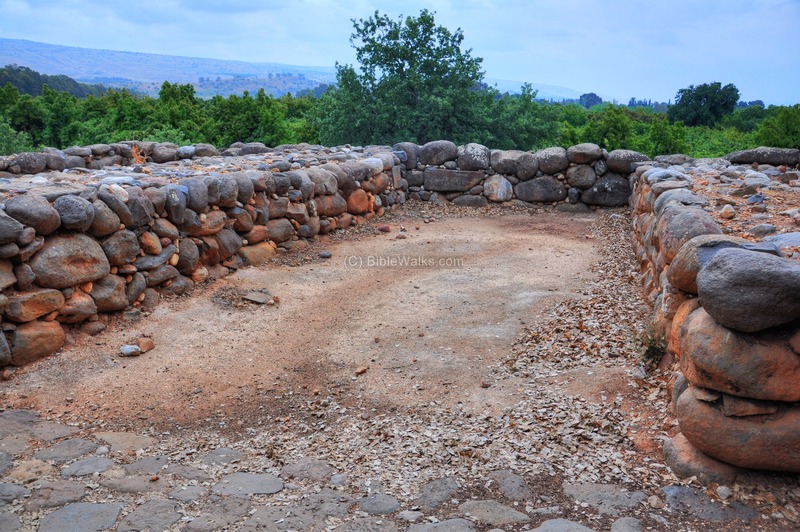 The old Canaanite gate was covered and sealed by the new walls. The reason for these massive fortifications was the fear from the danger from the north. Dan was a frontier city which protected the northern flank of the Kingdom (years later Jeremiah warned "...Out of the north an evil shall break forth upon all the inhabitants of the land"). 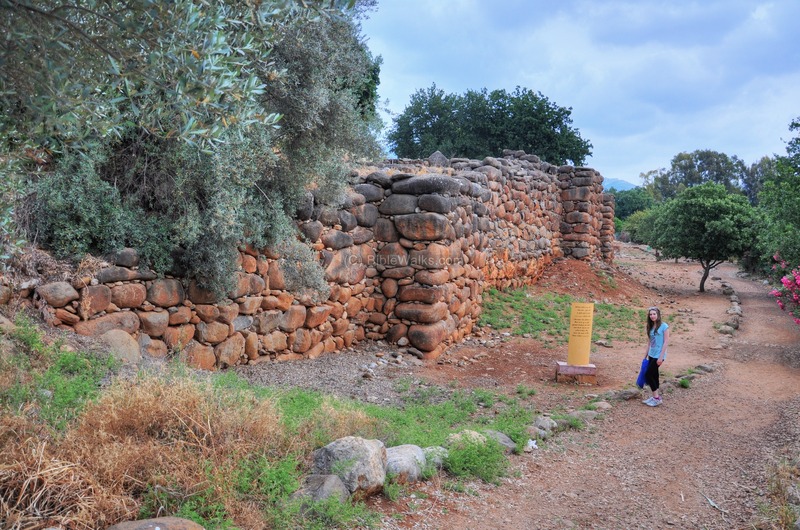 Kings Omri (882BC) and Ahab (855-850) reinforced the northern cities, such as Hazor which was doubled in size and new walls were added. After several clashes, King Ahab successfully pushed the Syrians out and Ben-Hadad was forced to make peace with the Israelites. The fortified city of Dan was destroyed in 734 BC during the Assyrian conquest. The order of the photos is from the external walls, through the gate, and up to the top of the city. The Israelites rebuilt the city on top of the Canaanite city, and added new walls along the earlier walls. A section of the wall was reconstructed on the southern side. 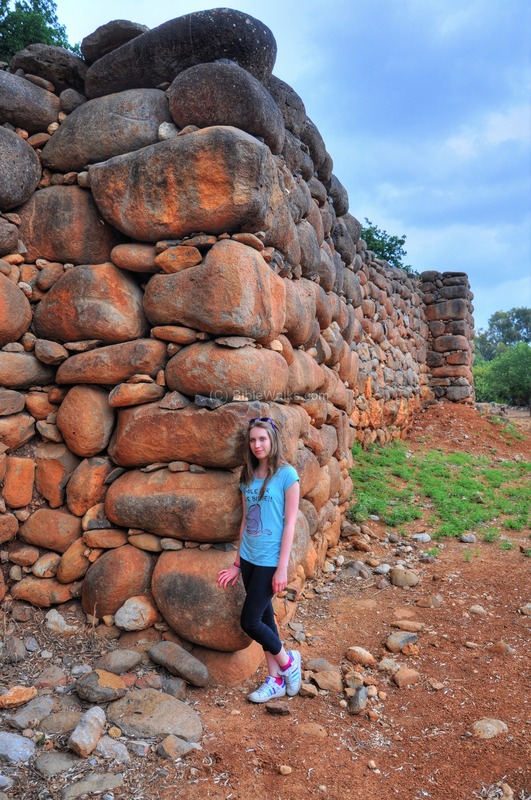 These walls were composed of large un-hewn basalt stones, supported with smaller stones . Amit, Webmaster Rotem's sister, stands below one of the towers along the wall. The following photo shows the section of the wall near the gate. 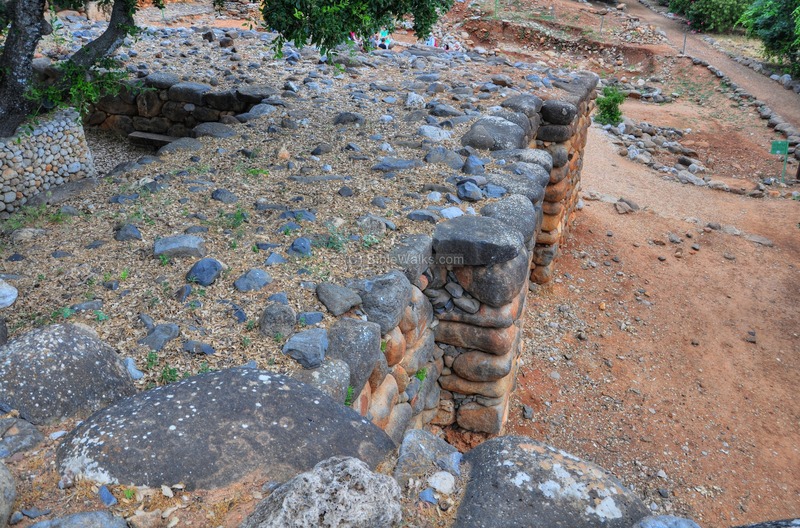 The large Israelite gate, dated to the Kingdom of Ahab (89h century BC), is located on the south side of the city. A wide paved open space (400m2), which is seen below, is located in front of the gate. The pavement of the open space is original. 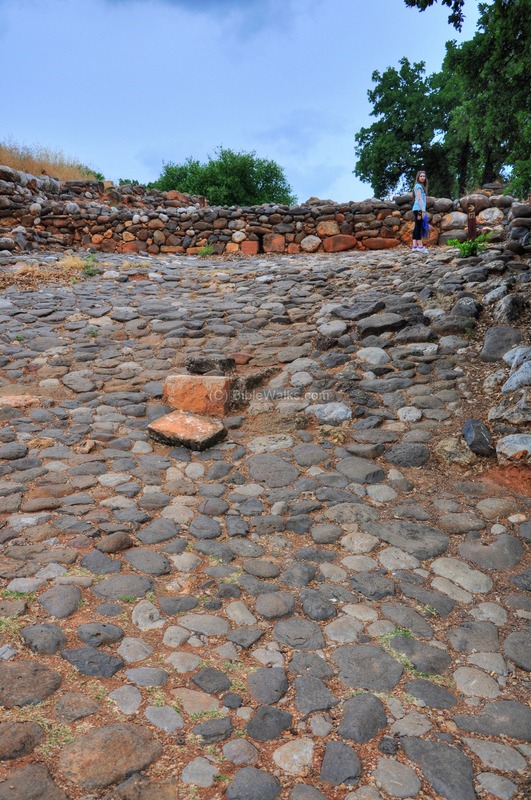 The main gate was composed of three pairs of beams surrounding a paved road that enters the city. 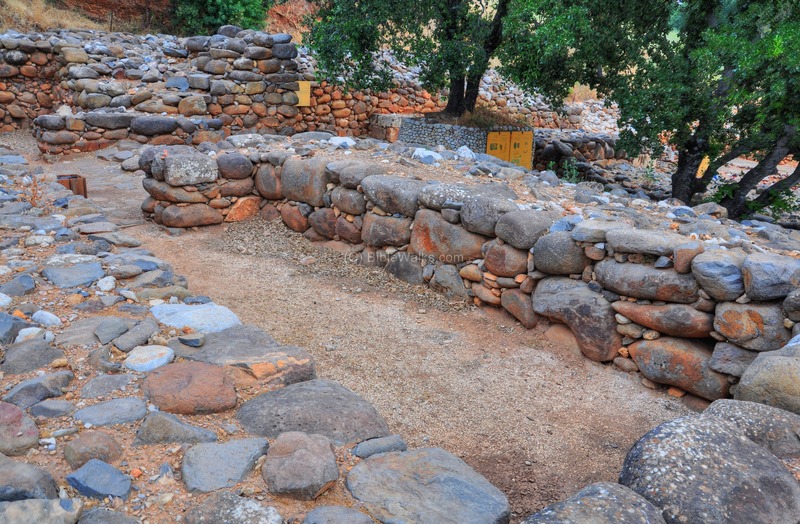 This design created four guard rooms which is typical of Iron age gates (for example, BethSaida/Zer). The total area of the four-chamber gate covers 500 square meters. There are two gates in this complex - an outer and an inner gate. 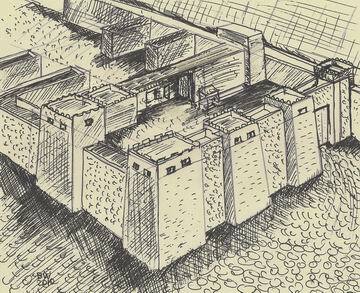 An illustration of the Israelite (Iron age) city gate and walls - as viewed from the external (eastern) side - is illustrated on the right. The road entered from the paved area through the outer gate which was located on the far right side. 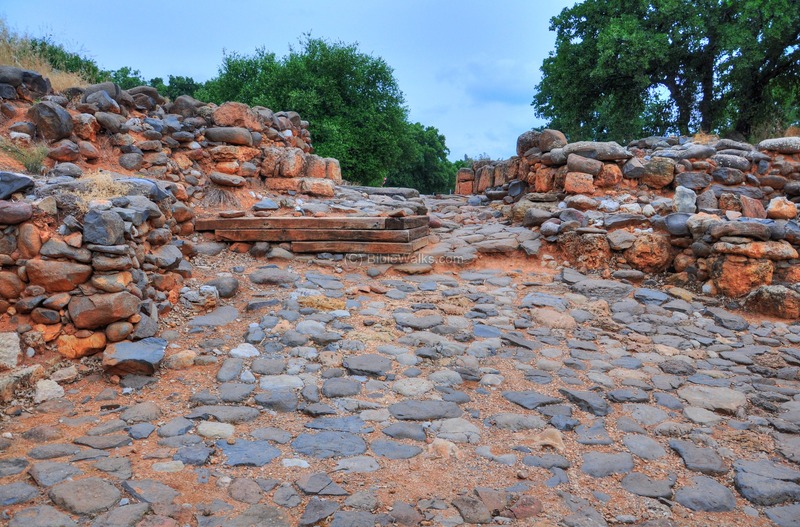 The road then turned to the left and around the wall, then passed a wooden gate of the inner gate. It then followed the direction of the south walls, passing through two pairs of chambers on each side of the road, where guards were stationed. 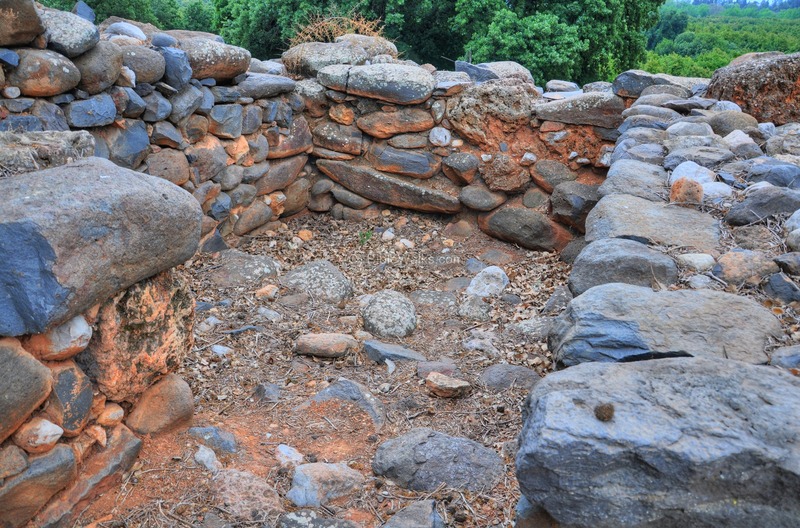 Both sides of the outer gate were reconstructed, as shown below. 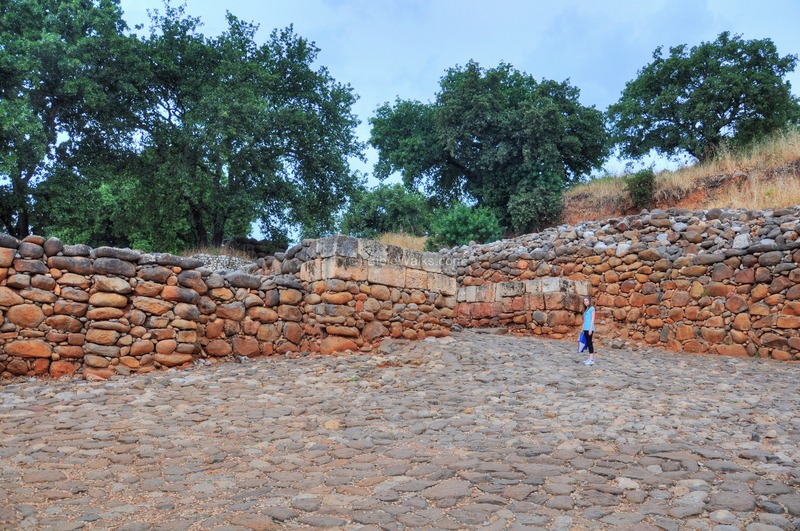 The threshold of the outer gate is composed of a large basalt stone. 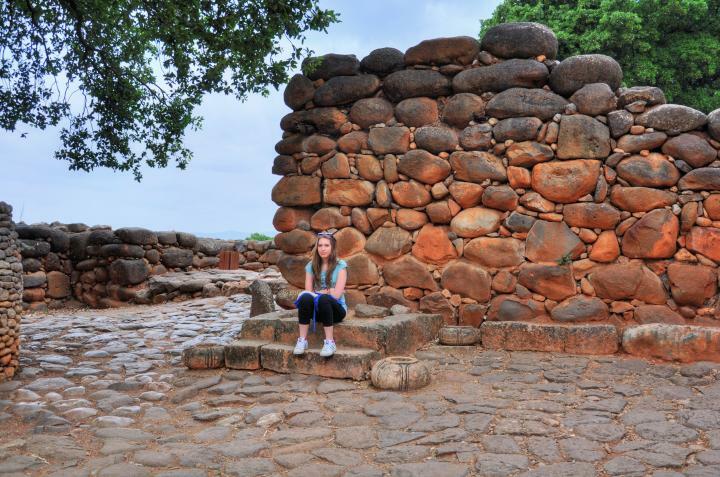 The walls are built of large basalt stones. The processional road winds its way to the left, passing through the inner gate. Opposite the gate's opening is a base of a canopy, which is based on the flower-shaped stones with top grooves that held the poles. A raised platform is located in the center. The standing stone on the left of the platform may have served as a divine icon during the ceremonies held in front of the place. 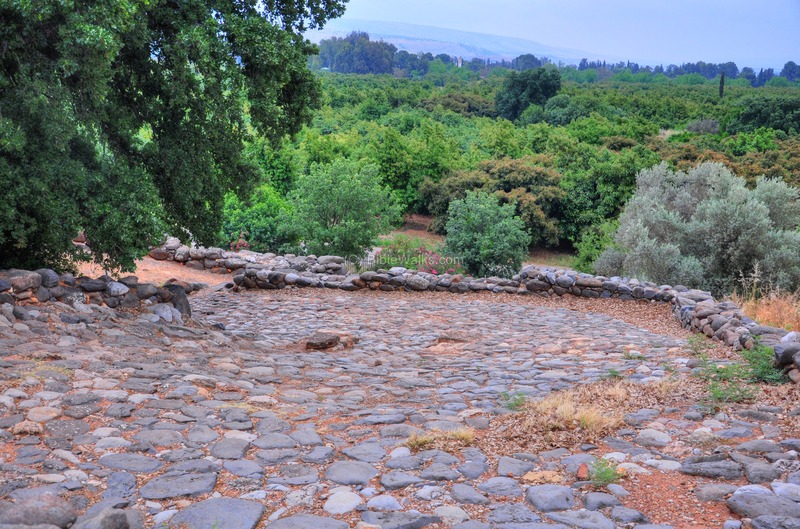 The raised platform may have been the sitting place of the King or Judge (2 kings 23:8): "Then the king arose, and sat in the gate...". Along the wall is a stone bench - on which the elders of the city sat. This custom is referred in several Biblical passages. Example (Ruth 4 1-2): "Then went Boaz up to the gate, and sat him down there...And he took ten men of the elders of the city, and said, Sit ye down here. And they sat down". The following picture shows a view from the top of the east side of the gate, looking down to the area outside the gate. 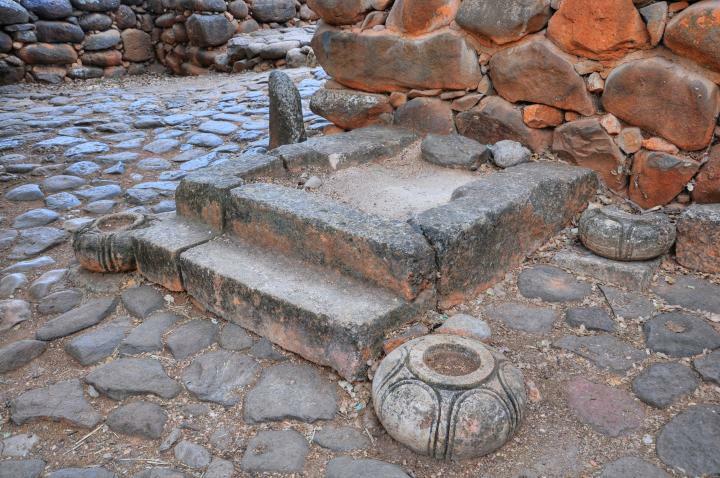 In this area, the excavators found fragments of a basalt stone with Aramaic inscription, dated to the 9th century BC. This unique stele includes to a reference to the "House of David", and parallels to the Biblical description (2 Kings 9) of the murders of Kings Joram and Ahaziah. The inner side of the gate is seen in the following photo, where the inner gate was standing. 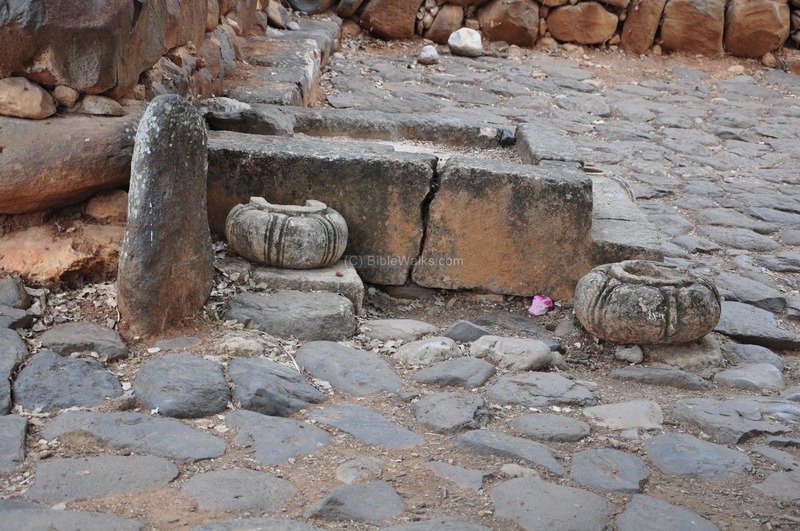 Beyond the threshold of the inner gate are two pairs of chambers on both sides of the road. A view of one of the eastern chambers is below. These chambers probably served as the quarters of the guards during wars, and functioned as storage rooms during peaceful times. After 70m it then turns sharply up the hillside (north) as a wide (10m) road. 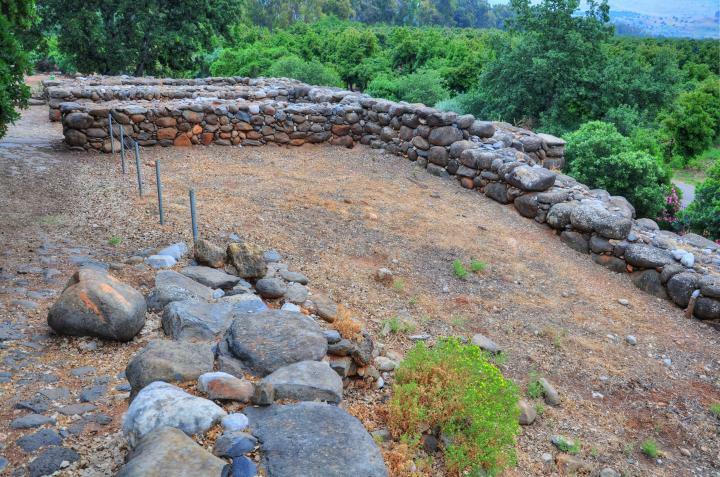 An inner gate is located on the south side on the top of the hill, which provided another layer of defense in case the main gate would have been breached. A detail of the standing basalt stone which is located inside a hole of a base stone. 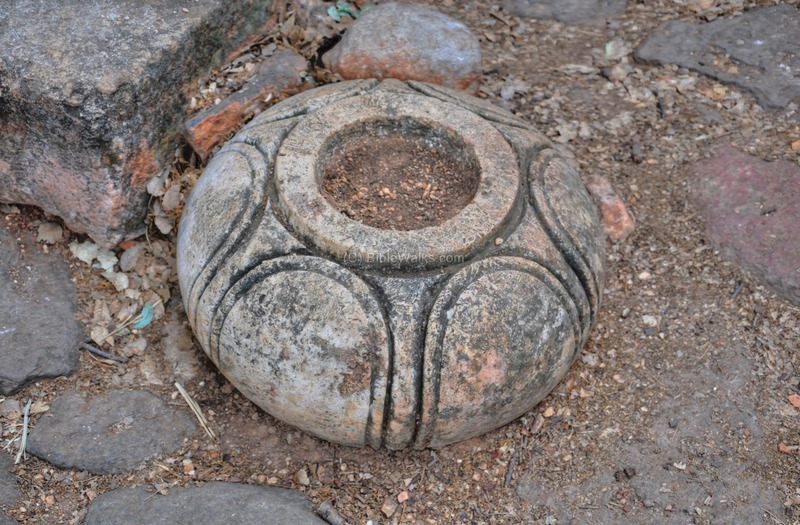 What is the purpose of this stone? 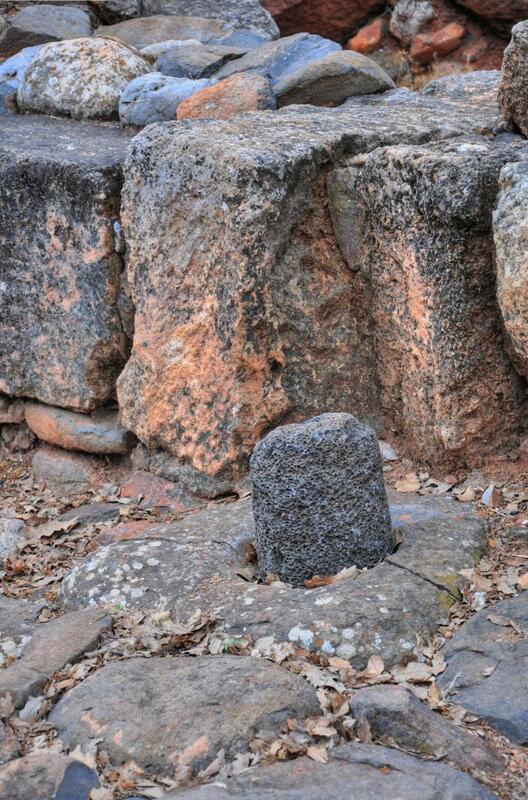 Is it an iconic stele? Or is it a door hinge? 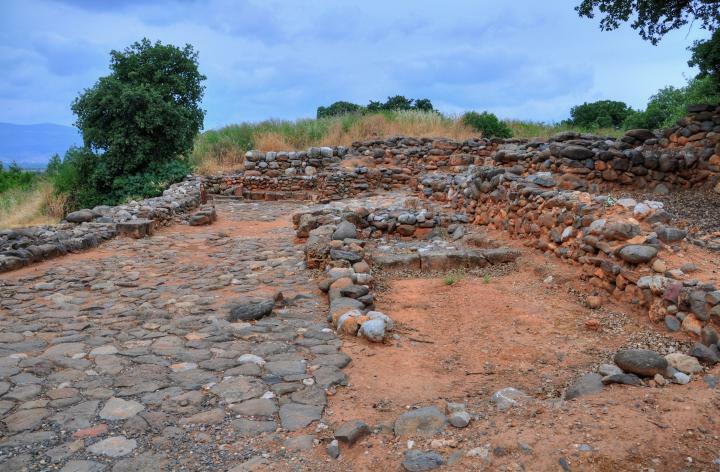 Inside the city are traces of ruins, in which the archaeologists excavated residential houses of the city dated to the Bronze (Canaanite) and Iron (Israelite) ages. Another view of the trenches is below. A layer of ash was detected, dated to the 9th century BC. 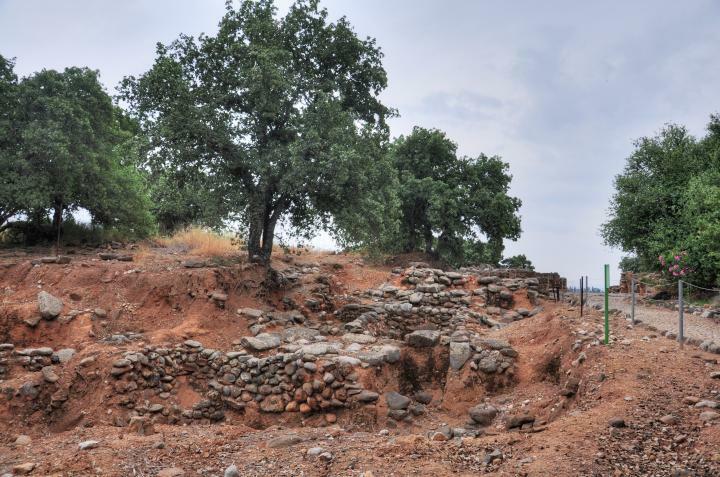 This may have been a result of the destruction by the intrusion of Syria's Ben-Hadad (885BC) along the North Jordan valley (1 Kings 15 20): "So Benhadad hearkened unto king Asa, and sent the captains of the hosts which he had against the cities of Israel, and smote Ijon, and Dan, and Abelbethmaachah, and all Cinneroth, with all the land of Naphtali". 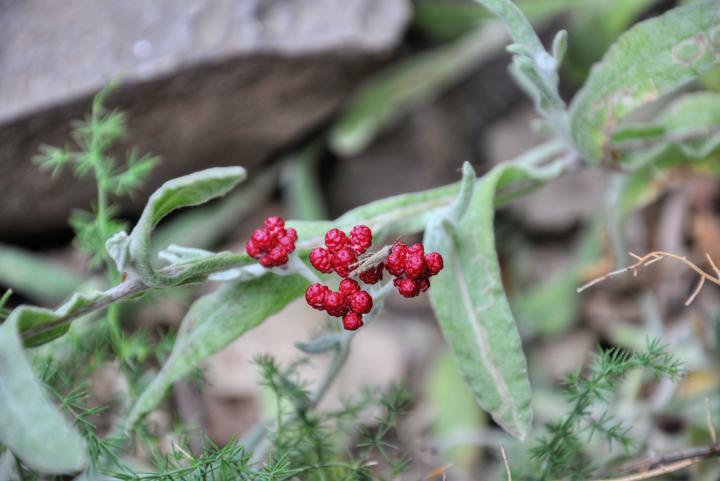 One of the flowers on top of the hill blooms in the spring time, and is called "Red Everlasting" (Scientific name - Helichrysum sanguineum, and in Hebrew: Dam Hamacabim - "the blood of the Maccabees"). According to the legend, the flower commemorates a place where the blood of the 2nd century BC Israelite freedom-fighter has been spilled. Indeed, an appropriate place to flower - a city which the Israelite warriors attempted to block the evil forces from the north. BibleWalks.com - Have Bible - Will Travel!